Design Circle are pleased to launch this year’s Skyline competition – our annual challenge to pick up an actual pen and, consequentially, win an actual pen! 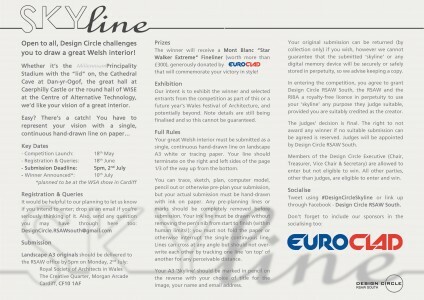 Our Mont Blanc fineliner pen prize is kindly donated this year by Euroclad. This year, we’re challenging you to draw a great Welsh interior – new or old, natural or human-made – but, as usual, you need to convey that with a single continuous line. As well as possibly entering yourself, we’d be very grateful if you could share this around your networks – emails, Twitter, Facebook, Instagram, and even the office pin-board (if these things still exist!). Thanks everyone, and good luck if you choose to enter!